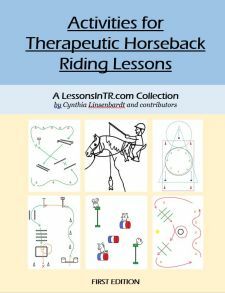 I recently had a reader write me for ideas about a rider with CVI – Cortical Visual Impairment. Although I have not had a rider with CVI before, I did write back with my initial reactions, which I wanted to share here in case anyone finds it useful, and open it up to additional suggestions or experiences! try different lighting to find what helps them see best – lighting from behind, the side, a flashlight, etc. look for subtle responses in the child: change in breathing, shifts gaze, changes body position, etc. I think a break from eyesight is a good idea to try. I would try doing this in several different ways to see what works best for the rider: just closing the eyes while the horse is moving (while sitting and while putting hands on withers), stopping the horse with and without closing the eyes (perhaps asking them what they want) (perhaps focus on feeling the horse breathing), stopping the activity but take a walk break around the arena. It stands out to me that it would be important to have the whole arena or part of the arena free from any visual clutter (and in our barn’s case, where the aisle is right by the arena, free from people moving around there). Somehow creating a part of the arena that is free from distraction. This could have two uses, first to have a safe area of the arena in which the rider can go when they are visually overloaded, and second to have a clear backdrop against which to introduce objects (such as a bright red ball against an all wood wall) so it’s more easy to distinguish what they are seeing. I would also keep the arena setup the same for at least the first several weeks so it’s always predictable visually to them, and then once they learn the objects visually, make changes in the setup, letting them know. It also stood out to use repetition and familiar objects (like balls, things from home). So the same exercises every week, or with only slight changes. 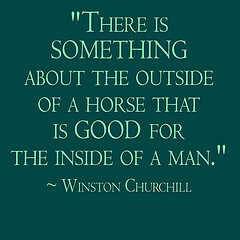 That is until the rider is comfortable enough with everything that you can change it up. Have any of you readers worked with a rider with CVI? What did you do for adaptations? Please share in the comments section below!